The Friends of Milton Regis Court Hall was formed in early 2011 by a group of people with a common appreciation of preserving our heritage, notably the Court Hall in Milton Regis, a building that still stands proudly as an icon of the streetscape after almost 560 years. 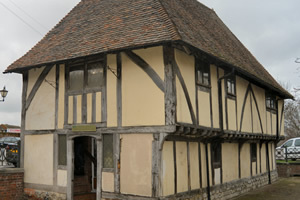 Built as Milton’s civic centre in c.1450 in the reign of Henry VI, its importance is that whilst at one time most towns would have had such a building, today there is only one other surviving example in Kent at Fordwich near Canterbury. This is why it is so important to preserve and maintain this historic building. The Friends Group is administered by a board of trustees and a managment committee. Open Saturdays only 10am to 4pm April to September (precise details on website). Other times for group visits by appointment.